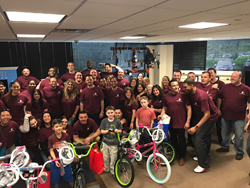 Planned Companies of Parsippany, NJ, came together to host their very own Build-A-Bike event, in which the team built several bikes that were donated to children at a local Boys & Girls Club. Planned Companies, the fastest growing real estate service provider, is giving back to communities and charities throughout the United States. Through their philanthropic initiative, Planned Cares, Planned Companies is elevating the community and impacting the quality of life for the residents and tenants that they service. "We are always on the lookout for new opportunities to donate our time and resources," stated Rob Francis, CEO of Planned Companies. " We make it a priority to not only deliver exceptional customer service, but to also find ways to give back to the areas that we live and work in." With their mission to enhance the quality of life of their clientele, they are just as focused on the people and organizations that reside in these areas. Last year alone, Planned Companies contributed over $30,000 to a number of organizations and causes. This included: Habitat for Humanity, Crohn’s and Colitis Foundation, Tunnel to Towers Foundation, Hope and Heroes, and more. "Many times, large businesses are primarily focused on the bottom line," explained Francis. "But here at Planned, we make a conscious effort to keep an eye on the balance sheet and still give back to those in need." And this goes far beyond just writing a check. Planned reaches out to their employees and staff from the Northeast region down to the Mid-Atlantic states to ensure that everyone does their part. From collecting thousands of toys for Toys for Tots to getting their hands dirty to renovate a local park, Planned 'cares' and takes pride in contributing their time and resources. While donating time, resource and money has always been a priority at Planned Companies, the Planned Cares webpage launched in December of 2017. Planned’s behind-the-scenes donations to the communities they serviceare now starting to be shared with the world. By sharing with everyone, they hope to inspire and encourage others to join in and participate in some great way.